The 34 metre motor yacht Cheeky Tiger has changed central agencies and is now listed for sale by Jonathan Browne at ABYS in France. Built in GRP by Italian yard Arno to a design by Andrea Bacigalupo, Cheeky Tiger was delivered in 2004 as one of the yard’s Leopard models and most recently refitted in 2017. Accommodation is for eight guests in four cabins comprising a master suite, VIP suite and two twins. All guest cabins have entertainment centres, television screens and en suite bathroom facilities while the crew quarters sleep eight members of staff aboard this yacht for sale. The main saloon has comfortable seating and a bar plus a sunroof that brings the outside in, making it perfect for entertaining. An elegant, sophisticated interior is complemented by Hermes crockery, Baccarat crystal and Christofle silverware, making every formal meal a gourmet experience. Cheeky Tiger has several outdoor spaces for relaxation, including a huge cockpit with built-in upholstered seating at the stern, a table and five chairs, while stairways to port and starboard curve down to the swim platform and hydraulic transom garage. For determined sun worshippers, the foredeck has a sun bed with upholstered cushions. Triple 2,000hp MTU diesel engines linked to KaMeWa water jets allow a cruising speed of 25 knots topping out at 35 knots. As an added sales incentive, included in the asking price is a brand new hull wrap to be done at the buyer’s convenience. 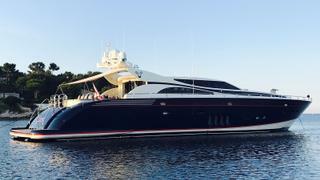 Lying in Antibes, France, Cheeky Tiger is asking €2,450,000.